Aly & AJ, known briefly as 78violet (pronounced: "seventy-eight violet"), are an American pop rock duo that consists of sisters Alyson and Amanda Michalka. They signed a recording contract with Hollywood Records in 2004. Their debut album, Into the Rush, debuted at number 36 on the US Billboard 200, and was later certified gold by the Recording Industry Association of America (RIAA). It has sold 839,000 copies domestically and one million copies worldwide. Their second album, Insomniatic, peaked at number 15 on the Billboard 200, selling over 39,000 copies in its first week and becoming Aly & AJ's highest debut to date. In 2009, Aly & AJ renamed themselves 78violet and officially announced their departure from Hollywood Records the following year. In 2013, the sisters released their first single in five years, "Hothouse". The duo had planned to release a full-length album in 2014, which was later leaked onto the internet during summer 2014. On December 9, 2015, the duo announced they had decided to return to their original name, Aly & AJ. Since then, the duo have been working on new music. On June 2, 2017, they announced a new single titled "Take Me". It serves as the lead single from their EP, Ten Years. The single was released on August 18, 2017. Aly & AJ's debut studio album, Into the Rush, was released on August 16, 2005, and certified Gold by the RIAA in March 2006. One of the album's singles, "No One", was featured in the Walt Disney Pictures feature film Ice Princess and its soundtrack. The song "Do You Believe in Magic", written, composed and originally recorded by The Lovin' Spoonful under John Sebastian, added a rock edge to the album. This cover was used in the soundtrack of the made-for-TV Disney Channel original movie, Now You See It..., in which Aly had a starring role as Allyson Henlen. "Do You Believe in Magic" became their first single to enter the top 20 of the Canadian Hot 100 chart, peaking at No. 23 and at No. 2 on the U.S. Billboard Hot Singles Sales. Into the Rush has sold 839,000 copies in the United States and one million copies worldwide. The album received positive reviews from critics. Fran Grauman from About.com gave the album a four star rating, praising Aly and AJ's "ton of talent" and "experience". Allmusic gave the album a mixed review, saying it "doesn't venture further than offering a few empowering ballads", to hand them 2.5 stars after. AMG does praise them for having a real singing ability, citing "Aly & AJ can actually sing – their vocals have more personality than prefab Disney hopefuls like Hayden Panettiere or Caleigh Peters – and the arrangements are slick without resorting to flashily empty pap." The review finishes by remarking, "Into the Rush is listenable, likeable and more about being memorable than being a Disney product." The album became the 112th best-selling album in the United States in 2006, earning it a place as No. 112 on the Billboard 200 end of the year chart of 2006. The sisters have been involved in various Walt Disney Records projects. The "Aly & AJ Concert" took place on July 24, 2005 at the Henry Fonda theater in Hollywood, California. The aired concert was cut to five songs and interviews, and included songs from Into the Rush. The sisters opened for The Cheetah Girls in December 2005, on the Cheetah-licious Christmas Tour. The album was re-released in August 2006 with three new songs, including the chart selection "Chemicals React" and two new versions of "Collapsed" and "Something More". It was also released in the United Kingdom. The sisters released their second studio album, the Christmas-themed Acoustic Hearts of Winter, on September 26, 2006. On the album, Aly & AJ recorded traditional Christmas songs. In late 2007, the sisters recorded three more original Christmas-themed selections. Acoustic Hearts of Winter debuted at No. 78 on the Billboard Hot 100, selling over 19,000 copies in its first week. The album also charted the U.S. Billboard Top Holiday Albums, debuting at No. 14. The holiday album later sold over 110,000 copies in the United States. The duo's third studio album, Insomniatic, was released on July 10, 2007. The album features a more electropop, electronic rock and dance-pop influenced sound different from their debut, with the use of synthesizers, synth-rock guitars, vocoder and electronic instruments. The album peaked at No. 15 on the Billboard 200, selling over 39,000 copies in its first week alone, and becoming Aly & AJ's highest debut to date. The album sold 700,000 copies in the United States. The album's electropop lead single, "Potential Breakup Song", had actually preceded their second studio album. Insomniatic, whose selections the Michalka sisters had written and composed themselves, was released on June 25, 2007. "Potential Breakup Song" peaked at No. 17 on Billboard's Hot 100, becoming their first top 20 single in the United States. The single was later also certified Platinum by the RIAA for sales surpassing 1 million copies. In October 2007, both the single and the album were released in the United Kingdom; "Potential Breakup Song" reached a peak position of No. 22 in the United Kingdom and No. 16 in Ireland. Aly & AJ toured for a short while in the UK, opening for McFly twice and performing at several television shows and nightclubs. Time magazine named "Potential Breakup Song" one of the 10 Best Songs of 2007, ranking it at No. 9. Writer Josh Tyrangiel praised the authenticity of its having been written by the teenage sisters who sing it. The track also went to chart solely on digital download in several countries like the Netherlands, Norway and Canada. Subsequently, after the success of the album's first single, Insomniatic was praised by numerous music critics. 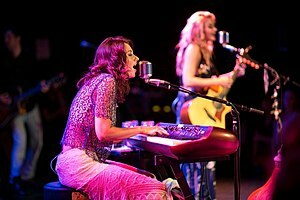 USA Today published an article stating, "for Insomniatic, the sisters had a hand in writing every song. The single 'Potential Breakup Song' sounds somewhat like Del Shannon's 'Runaway' run through a processor, but there's a lot more going musically than on your average teen-pop album." Hollywood Records general manager Abbey Konowitch said, "they write their material; they play their instruments. They aren't in any way manufactured. That's very important." Fraser McAlpine of BBC Radio stated, "Aly and AJ's previous album was rock-pop; some of it light and bubbly, some of it bordering on heaviness. Staccato, often angry pop but still definitely pop. Their second offering, 'Insomniatic,' with this as the lead single seems to have kept the staccato and the venom but added more layers of pop, to create something that sounds like My Chemical Romance going through a blender with some soft-hearted Angry Girl Music." McAlpine also added, "don't let the tango at the start fool you, even as the synths and the vocoder cut in, this is a rock song playing with electronics. Chirpy keyboards flag up the growl of their voices as they deliver self-conscious lines like 'it took too long, it took too long, it took too long for you to call back and normally I would just forget that, except for the fact it was my birthday, my stupid birthday,' kicking a guy to the curb for being a forgetful loser amid a glorious barrage of seething rhythms, clicky noises and general madness, as the Michalka sisters swing between honeyed murmurs and psychosis, making for the most danceable mental breakdown I've heard in quite some time." In December 2007, the news revealed that the band would be replacing the Jonas Brothers as the opening act for the extension of the Best of Both Worlds Tour that Destiny Hope "Miley" Cyrus had been conducting as Hannah Montana from January 11–24. The band also confirmed their second single "Like Whoa", which reached number 63 on the Billboard Hot 100, and charted later in Australia and Canada. In early January 2008, Aly & AJ performed a cover of KT Tunstall's "Black Horse and the Cherry Tree" on Yahoo's Pepsi Smash video site. The cover is also featured on the Japanese re-release of Insomniatic, recorded at the Abbey Road Studios. Also, Aly & AJ covered the song "We're an American Band" for Randy Jackson's Music Club, Vol. 1; their interpretation of the Grand Funk Railroad rock classic served as a bonus track. In early 2008, Billboard confirmed that Aly & AJ were working on a third studio album which was due to be released in late 2009. They mentioned in an interview with Radio Disney on April 23, 2008 that they were going for a "rockier" sound, and that this time they wanted to sing separately, not harmonizing their voices as they had on their previous albums, to let fans identify which Michalka sister was singing. On October 7, 2008, the up-to-then-yet-untitled album had been confirmed for a release in April 2009 by a Hollywood Records representative; however, a month later, the duo revealed in an interview that the album had been delayed until the summer of 2009. In later interviews though, the duo mentioned a release date of fall 2009, and lastly, on September 30, 2009, the duo claimed an early 2010 release of the record. The duo wrote a song (later confirmed to be titled "The Next Worst Thing") with Weezer frontman Rivers Cuomo. They also worked with Chris Lord-Alge (Green Day, AFI, Sum 41) and Rob Cavallo (Green Day, The Goo Goo Dolls, Paramore), both producers in the rock genre. Throughout 2009, various songtitles were added to the database of Broadcast Music Incorporated, written and composed by the duo, and jointly written and composed in collaborations with Daniel James and Leah Haywood. Rumors of Aly & AJ touring in the summer of 2009 surfaced the internet, but Aly Michalka later denied them on the sisters' official website. They stated that they were finalizing the record and wanted to focus on that at the moment. They also revealed that they wanted to tour in early 2010 to promote the new album. On July 8, 2009, the duo announced that they changed the team's name to 78violet. A week later, on July 16, 78violet announced that their third album will be self-titled. On February 19, 2010, 78violet announced on their official Facebook page that they had officially parted ways with Hollywood Records, and their new self-titled album, 78violet, probably would not be released. However, the duo stated that they were continuing to write and record for a new album. On December 1, 2010, 78violet's first song under the name of 78violet was released with the Hellcats soundtrack EP. 78violet recorded the theme song to Hellcats, titled "Belong Here". On January 24, 2011, a video of 78violet in the studio was released where a clip of a new song, titled "Suspended", was played. Some of the titles being considered for 78violet's fourth album were 8 Hours and 53rd floor. Aly mentioned that they had joined forces with a new production company. On June 18, 2012, 78violet announced that they were "Off to NY to start cutting instrumentals for the record." On June 19, 2012, they announced that they had started the first day of production for the album, saying, "Officially the first day starting the album production: it's taken 5 years but we are here!" On June 22, they announced that the "Album track list is officially set:)", calling it "not what you expect". On October 15, 2012, they tweeted that their album is complete and expected sometime 2013, with the possibility of a single in summer of the same year. Aly & AJ later confirmed that the lead single would be "Hothouse". On May 2, 2013, Aly & AJ signed to Red Light Management which will be the music management company of all their future music. The single would be released on July 8, with an album to follow. The duo also performed live for the first time in five years when they took the stage for special shows at the Roxy Theater in Los Angeles on June 26 and the Gramercy Theater in New York on July 9. "We couldn't be more ready or excited to introduce our amazing fans to the new and evolved sound behind 78Violet," said Aly and AJ Michalka in a press statement, June 5, 2013. "These two upcoming shows will allow us to share a small taste of the alternative pop vibe that you'll hear on the album in an organic and up close and personal setting." New original songs performed on the first show include: "Hothouse", "Boy", "53rd Floor", "Heart", "Hole in the Earth", and "8 Hours". The group announced that they would be releasing an EP in early 2014, however, this never materialized. On December 9, 2015, the sisters returned to music and changed their name back to Aly & AJ. On April 5, 2016, they had a Q&A on their official Twitter page where they confirmed they would start working on the new album in April. They planned to write and record the new album together with Mike Elizondo and Ryan Spraker. As of April 26, 2017, the duo confirmed via Twitter that they were planning on releasing an EP soon. On June 2, 2017, they announced a new single, titled "Take Me". It serves as the lead single from their EP Ten Years, and was released on August 17, 2017. The accompanying music video was released on September 14, 2017. Their EP, Ten Years, was released on November 17, 2017. Two tracks from the EP, "I Know" and "The Distance", were featured in season 4 of Aly's TV series iZombie. On June 15, 2018, the duo released the single "Good Love". They additionally announced the release of the deluxe version of Ten Years, which was released on November 30, 2018. On March 29, 2019, the pair released the single "Church" as the lead single from their forthcoming EP Sanctuary. The EP will be supported by a North American tour of the same name which begins on May 1, 2019. Huckleberry Toys released Limited Edition Hello Kitty Aly & AJ dolls to selected Target stores. Toys R Us sold a line of the dolls beginning on November 15, 2007. On November 20, 2007, The Aly & AJ Adventure game was released for the Nintendo DS. In the game, the player plays as their assistant, who helps them record songs and direct a music video. In June 2008, the duo released their own paperback adventure books, called Aly & AJ's Rock 'n' Roll Mysteries, each part describing Aly & AJ on tour, every book describing a mystery in a different city. The drawings in the books were done by Aly. The first two (First Stop, New York and Mayhem in Miami) were released on June 12, the third installment (Singing in Seattle) on September 2, and the last (Nashville Nights) went to stores on October 4, 2008. Performance Designed Products released Aly & AJ-designed guitars on November 10, 2008. 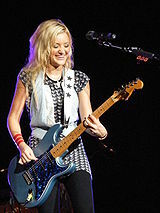 Aly's guitar features a heart-and-crossbones print in pink (PlayStation 2) and AJ's guitar is in the shape of the Aly & AJ heart logo featuring bright pink and purple zebra print (Wii, PS2). The duo launched the guitars on October 11, 2008 during event at Universal Studios CityWalk in California. The duo also had clothing, accessories, jewelry, and cosmetics lines. According to Forbes and AOL, they were one of Hollywood's highest earning singers under the age of 30 in 2008. The sisters were the spokeswomen for Samsung's Hope for Education, which provides technology products to needy schools, and were the co-chairpersons for the Children's Advisory Board of the AmberWatch Foundation; they performed at a benefit concert to raise money for the charity. The song "I Am One of Them", which was featured in the debut album, Into the Rush, is dedicated to work with AmberWatch. The duo also walked a fashion show for the Race to Erase MS show in early May 2008. On June 26, 2008, an Ohio man named Rex Mettler was arrested for stalking the duo. The Lancaster man "obtained contact information for the acting and singing duo and made threats online, by phone and handwritten notes" as stated by the police. The duo was scheduled to perform June 27, 2008 in Cincinnati, where the man was present, after which the police couldn't confirm that any of the threats involved the Ohio show. The police later stated that "the charge against Mettler stems from incidents that began December 15, 2007" and that "Rex displayed a pattern of activity over that time that reflected multiple attempts, if not numerous attempts, at stalking these females." Two years later, on June 17, 2010, Caesar Brantley was arrested on suspicion of stalking the duo. He pleaded not guilty. Aly claimed Brantley is an "obsessed fan" who is determined to marry her "no matter what" in filings for the restraining order. Another court hearing was scheduled on June 30. Along with making music for the mainstream audience, Aly & AJ, who are both very open about their faith, were significant in the Christian music rock scene. "Never Far Behind" was only released on Christian rock radio. It went to No. 1 on Radio & Records (R&R) Christian CHR. The duo does not wish to be labeled as Christian music artists. In an interview with Blender magazine in June 2006, Aly & AJ said that their music comes from a Christian perspective. "We don't ever wanna preach or shove anything down people's throats, but we want our music to be inspiring." AJ added, "If we have a Muslim fan or an atheist fan, that's their thing – I'm gonna love them no matter what." In 2010, Aly Michalka stated in an interview with Seventeen magazine, "My faith is definitely a big part of my life, but not part of my career. It is something that guides me. But I feel like when you make a declaration of your religion, people automatically go after you when that purity ring comes off. So I don't want to set myself up for that kind of judgment." In a 2006 interview with Blender magazine, the two expressed their disbelief in evolution. In 2018, Aly & AJ stated in an interview with AWAL that they do believe in evolution. The pair later reiterated their pro-evolution-theory stance in response to a fan on Twitter, writing: "Yes to evolution...thank God for the glow up in not just body but mind". ^ "[REVIEW] Aly & AJ - 'Ten Years' | The Daily Listening". The Daily Listening. November 17, 2017. Retrieved November 17, 2017. ^ "We can't contain our excitement for Aly & AJ's new EP - United By Pop". United By Pop. November 13, 2017. Retrieved November 17, 2017. ^ "Alleged Aly & AJ Stalker Arraigned". E! Online. June 27, 2008. Retrieved May 11, 2010. ^ a b Katie Hasty, "T.I. Holds Off Pumpkins, Interpol To Remain No. 1", Billboard.com, July 18, 2007. ^ Aly & AJ [@alyandaj] (December 9, 2015). "#Weareback #Wednesday @alyandaj" (Tweet) – via Twitter. ^ a b Michalka, Aly & AJ (June 4, 2017). "pic.twitter.com/WKdp2jiOhZ". @alyandaj. Retrieved June 5, 2017. ^ a b c Norwin, Alyssa; Norwin, Alyssa (June 2, 2017). "Aly & AJ Just Released A New Song & Everyone's Freaking Out — Listen To 'Take Me'". Hollywood Life. Retrieved June 5, 2017. ^ "Aly & AJ New Single Release Date". ^ "Aly and AJ Return As 78Violet, Announce 'Hothouse' Single". Billboard. Retrieved April 25, 2010. ^ "BMI - Aly and AJ". BMI. Retrieved April 25, 2010. ^ Grauman, Fran. ""Into the Rush" – Aly and AJ". About.com: Children's music. Archived from the original on November 23, 2007. Retrieved January 3, 2009. ^ Into the Rush > Overview AMG. ^ "Aly & AJ Music News & Info". Billboard.com. Archived from the original on April 14, 2010. Retrieved May 11, 2010. ^ "Aly and AJ - Acoustic Hearts of Winter: review". Entertainment Africa. Archived from the original on January 13, 2016. Retrieved April 25, 2010. ^ "Insomniatic, the third studio album by Aly & AJ". OV Guide. Archived from the original on March 25, 2014. Retrieved January 16, 2010. ^ a b "Potential Breakup Song" Chart Trajectory on Billboard 200, based on Billboard.com info Archived July 22, 2009, at the Wayback Machine, Aly & AJ Reaction. ^ Tyrangiel, Josh; "The Best Top 10 Lists of the Year"; "The 10 Best Songs"; Time magazine; December 24, 2007; Page 39. ^ Tyrangiel, Josh (December 9, 2007). "''Time'' magazine's Top 10 Songs of 2007 at". Time.com. Retrieved May 11, 2010. ^ a b c Mansfield, Brian (July 8, 2007). "Aly & AJ pull out all the stops in 'Sweet' sister act". USA TODAY. Retrieved January 3, 2009. ^ "Aly & Aj Potential Breakup Song". Bbc.co.uk. October 4, 2007. Retrieved May 11, 2010. ^ ""Black Horse & the Cherry Tree" video at Yahoo! Music". Music.yahoo.com. Retrieved May 11, 2010. ^ Aly & AJ Writing New Songs, Plot Films. Billboard. January 10, 2008. ^ "Aly & AJ On Radio Disney". Aly & AJ Reaction. April 24, 2008. ^ "April Rules!! "[permanent dead link] Aly & AJ Reaction. October 9, 2008. ^ Aly & AJ [@alyandaj] (October 1, 2009). "@SJC4783 the beggining of 2010...I know it seems like forever but it'll be worth the wait! Thanks for the support xo aly" (Tweet) – via Twitter. ^ Samuel Crone [@SJC4783] (October 1, 2009). "@78violet when are we going to hear some tracks from the new album or get more nose. I bet this one will be sick!" (Tweet) – via Twitter. ^ "The Billboard Q&A: Rivers Cuomo". Billboard. December 7, 2008. ^ "In a session with Chris Lord Alge & Rob Cavallo, two of our f... on Twitpic". Twitpic.com. May 13, 2009. Retrieved May 11, 2010. ^ "BMI confirms new Aly & AJ song"[permanent dead link]. Aly & AJ Reaction. January 16, 2009. ^ "3 new songtitles! "[permanent dead link]. Aly & AJ Reaction. June 10, 2009. ^ Sophia, Gino (November 15, 2009). "Info on the new album". 78violet Reaction. Archived from the original on October 19, 2009. Retrieved January 13, 2016. ^ "Aly And AJ - Famous Girl Bands". ^ "Niet compatibele browser". Facebook. Retrieved May 11, 2010. ^ "78Violet in the studio". YouTube. January 24, 2011. Retrieved September 16, 2011. ^ "78violet Live Chat - July 15th 2011- Part 1 [Oh-78violet.com]". YouTube. July 18, 2011. Retrieved September 16, 2011. ^ "Aly and AJ Return As 78Violet, Announce 'Hothouse' Single". Billboard. Retrieved June 8, 2013. ^ Aly & AJ [@alyandaj] (April 5, 2016). "P.S. We'll be writing and recording this upcoming record with Mike Elizondo and Ryan Spraker" (Tweet) – via Twitter. ^ "Aly and AJ to Release an EP". ALYANDAJDAILY.COM. Retrieved April 26, 2017. ^ Stubblebine, Allison (November 3, 2017). "Listen to Aly & AJ's Dreamy Dance Pop Track 'I Know'". Billboard. Retrieved November 3, 2017. ^ "S4 · E7 · Don't Hate the Player, Hate the Brain". Tunefind. April 16, 2018. Retrieved August 29, 2018. ^ "S4 · E3 · Brainless in Seattle Pt. 1". Tunefind. April 16, 2018. Retrieved August 29, 2018. ^ "Aly & AJ – "Good Love"". Spin. June 15, 2018. Retrieved November 19, 2018. ^ "Aly & SleighJ on Instagram: "Friday November 30th. Ten Years (Deluxe)."". Instagram. Retrieved November 28, 2018. ^ "Aly & AJ Launch A New Era With Self-Reflective Single "Church"". Idolator. March 29, 2019. Retrieved March 29, 2019. ^ "Hollywood's Top 20 Young, Famous & RICH". AOL.com. Retrieved January 16, 2010. ^ "Alleged Aly & AJ Stalker Arraigned".. Retrieved June 27, 2008. ^ "Aly & AJ stalker arrested".. Retrieved June 29, 2008. ^ a b "Aly And A.J. 's Alleged Stalker Pleads Not Guilty". Starpulse. June 17, 2010. Retrieved June 23, 2010. ^ The Daily Telegraph staff (June 21, 2010). "Aly Michalka's stalker Ceasar Brantley allegedly wants to marr her". The Daily Telegraph. Retrieved June 23, 2010. ^ a b Tweenage Riot. Archived December 18, 2008, at the Wayback Machine Blender magazine, June 2006. ^ "Culture Clips". Seventeen. September 2010. Archived from the original on September 16, 2010. ^ AWAL Interview Archived December 19, 2018, at the Wayback Machine AWAL, December 2018. ^ Evolution Tweet Archived March 29, 2019, at the Wayback Machine ""Twitter"", March 2019. ^ a b c d "Radio Disney 411 Music Awards". YouTube. December 29, 2007. Retrieved February 22, 2014. ^ "Vote for the Best Siblings in Pop, From the Jonas Brothers to 78Violet". Popdust. June 23, 2013. Archived from the original on March 31, 2014. Retrieved February 22, 2014. Wikimedia Commons has media related to Aly & AJ. This page was last edited on 15 April 2019, at 16:09 (UTC).